The hybridizer's perfect cross between the exotic Orientals and regal trumpet lilies. Orientals are known for their fragrance, spectacular color and flower size. Trumpets are known for their trumpet-shaped flowers, they naturalize well and are easy to grow. The sturdy stems on these lilies can reach a height of 3-4', with large, sweet-smelling blooms 3-6" in size in the first year alone. 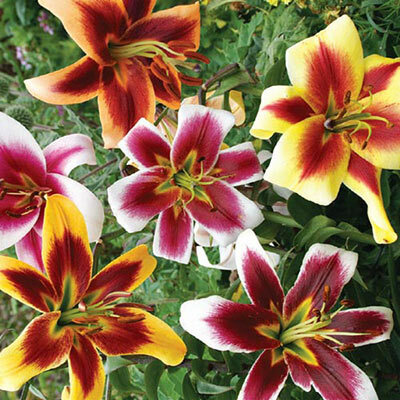 By the second year, they can shoot up to 5-6', and within three years these lilies can reach as high as 6-8' with masses and masses of beautiful blooms to enjoy. The surge in height of these lilies is owed to their extraordinary ability to produce multiple stems from a single bulb. Out facing, pendant flowers with thick waxy petals. Linear, green leaves arranged in whorls or spirals up the stems.